Treat your favorite chocolate lover to this impressive gift box filled with a selection of decadent chocolate treats. Soft, buttery caramels from Fran's Chocolates are dipped in rich, 64% dark chocolate and finished with grey salt harvested off the sea of Brittany, and 7 pieces of these celebrated caramels are included here. If that's not enough, we've included ten salted chocolate caramels from Montana's Béquet Confections. Handcrafted in small batches, B&eactute;quet caramels are 7-time award winners, and a delicious addition to any chocolate gift. 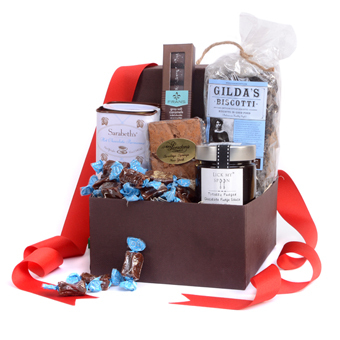 A box of six luxurious waffle cookies with a soft butter toffee center and enrobed with the finest Belgian dark chocolate is included, along with a bag of crisp, artisan-style chocolate espresso biscotti from Gilda's biscotti. Serve either alongside a cup of Sarabeth's Hot Chocolate Parisienne.......arguably, the finest cup of hot chocolate you'll find outside of Paris. The crowning touch to this chocoholic's dream gift is a jar of Lick My Spoon's Totally Fudged Chocolate Fudge Sauce. This thick, rich, creamy sauce is made with Valrhona 100% cacao, and is irresistible over ice cream, fresh fruit, or blended into warm or cold milk for an intensely flavored chocolate drink. A gift to give any time of year ....... to anyone who loves chocolate! Fran's Chocolates - Grey Sea Salt Caramels: Buttery caramel dipped in rich dark chocolate and sprinkled with French sea salt. Béquet Confections - Salted Chocolate Caramels: Award-winning caramels, handmade in Montana. Tregroes Waffles- Dark Belgian Chocolate Waffle Cookies: Decadent wafer cookies with a buttery caramel center, enrobed with the finest dark chocolate. Gilda's Biscotti - Chocolate Espresso Biscotti: Twice baked and hand-cut for a crisp, artisan-style biscotti with deep chocolate flavor. Sarabeth's - Hot Chocolate Parisienne: A thick, rich drinking chocolate and a perfect warm-up on a cold, blustery day. Sapore della Vita - Lick My Spoon Totally Fudged Chocolate Fudge Sauce : Made from Valrhona 100% cacao, this thick, intense sauce is ideal for warming and spooning over ice cream, fresh fruit, or spreading between the layers of a cake. Kraft Gift Box, 11 1/8" x 8 3/4" x 4"